A luxurious, hypo-allergenic pillow featuring a premium micro fibre filling naturally resistant to bacteria and other allergens. Encased in a 250 thread count 100% fine cotton to provide extra breathability, this technically advanced pillow combines light weight luxury with superior head support and neck alignment. Experience an amazing cloud-like sleep with the Signature Sleeps high-loft mattress topper. Designed to provide an unsurpassed level of comfort, this thick and luxurious featherbed is overstuffed with the finest small feathers and covered in a 100% cotton, 260 thread count leak proof casing. The lofty, baffled square design prevents shifting and cold spots, and makes the Signature Sleeps topper the luxury you have been dreaming about. Comfort doesn’t get any better than the innovative Signature Sleeps duvet. Created using a technically advanced micro fibre filling, this luxurious quilt offers down like luxury combined with the added benefit of being hypo allergenic and perfect in all seasons. The square box construction offers stability and prevents the fill from shifting. Encased in a superior all natural 100% cotton casing, this deluxe quilt is a perfect accompaniment to a pampering and rejuvenating night’s sleep. 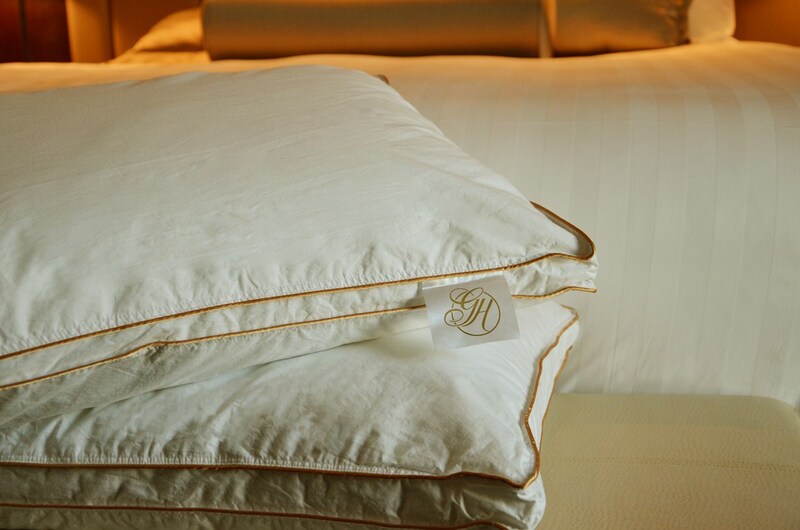 Featuring a sateen stripe, the silky smooth finish of the 100% pure cotton presentation sheet offers indulgent luxury and classic style. Constructed from the finest quality pure cotton, and woven with a 300 thread count, this sheet offers a relaxing surface to lay on: smooth, cooling and luxurious. Crafted from fine percale weave, 300 thread count pure cotton, the luxurious Gambaro Hotel Signature Sleeps bed linen has a crisp finish that is smooth against the skin. The natural fibres provide a sumptuous texture, and also control moisture and regulate body temperature to ensure a blissful night’s sleep. Introducing Sealy Posturepedic’s most luxurious bed ever supplied to an Australian hotel – exclusively at Gambaro Hotel Brisbane. Sealy Posturepedic Exquisite™ is designed to allow your body to completely relax and recover like no other bed. A good night’s sleep is essential to a healthy body and optimal performance. With technology that delivers outstanding support, unique design features, and using the finest materials, you can escape to the luxury of deep sleep every night. A bed that combines precision engineering with outstanding aesthetics. Exclusively developed and made only in Australia, Sealy Posturepedic Exquisite™ features the unique ReST™ coil – true Responsive Support Technology designed to perfectly cradle and support every part of the body. Sealy Posturepedic Exquisite™ provides the ultimate balance of pressure relieving comfort and deep-down, orthopedically correct support. Experience it now, exclusively at Gambaro Hotel Brisbane. Packed with Sealy’s advanced technology and functional features, Sealy Posturepedic Dynasty provides superior comfort and support. Experience an outstanding night’s sleep with titanium construction that senses your body weight and responds with initial conforming supports, then provides the extra correct support your body needs. Sealy’s UniCased® technology offers premium stability for reduced motion transfer, giving you the best possible sleep experience. This hand built mattress is combined with a designer base featuring contemporary textured linen fabric, providing a stylish and elegant finish. This designer base contains the Shock Abzzorber® foundation technology which works with the mattress for a superior working foundation.